Fluence Corporation Limited is pleased to announce that it has signed recently an exclusive partnership agreement with ITEST in central China, to supply Aspiral Smart Packaged wastewater treatment plants along the highway system under their scope. ITEST is responsible for the engineering consultancy and supervision of the highway system in central China, including management of its wastewater treatment requirements. 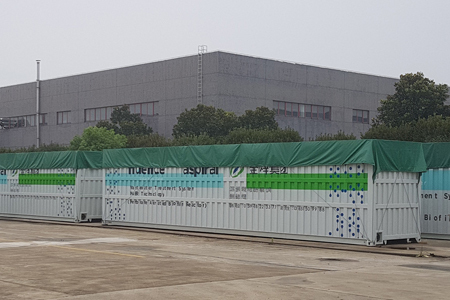 In July 2018, Fluence announced a sale to ITEST of an Aspiral 200 m3/day Smart Packaged wastewater treatment plant for a highway service area in China. This unit was shipped, delivered and installed within 6 weeks. As a result of the successful execution of this project, ITEST will now promote and implement Aspiral for the wastewater treatment needs of other highway systems. In accordance with the China Highway Construction Standards, every 50 km of highway require a service area, which has an estimated treatment capacity of 200-600 m3/day of influent flow of wastewater. The agreement anticipates that an estimated 80 Smart Packaged wastewater treatment plants comprised of Aspiral units will be needed in the coming 18 months. Pursuant to the agreement, for ITEST to maintain the exclusivity, it needs to promote and implement a minimum volume of 66,000 m3/day to be delivered over the next three years with annual minimum targets. This volume, which is anticipated to be placed in accordance with the terms of this agreement, is equivalent to an estimated US$45 million. The first implementation under this partnership is expected to be booked and delivered before year-end. For so long as ITEST meets those minimum volumes, it will be granted exclusivity for the sale of Aspiral units to service highways in central China.